Murphy is an 8-year old, neutered, male, Soft Coated Wheaten Terrier. He resides with his owners Kathy and Greg and a 9-month old, male, neutered, Soft Coated Wheaten Terrier named Mingo. For the most part Murphy is an outstanding pet. He has excellent overall household manners. He is usually obedient. He gets along very well with people. However, he has had intra-pack conflicts with Mingo that are escalating in frequency and severity as Mingo has become more physically and emotionally mature. In addition, since 1 year of age Murphy has exhibited reactive behavior when walked on-leash amidst unfamiliar dogs. To make matters worse, if walked in conjunction with Mingo and proximal to an unfamiliar dog, the event typically foments Murphy to commence redirected aggression toward Mingo. Initially, Mingo would capitulate to Murphy. Yet, now that Mingo has become more physically capable, exhibits higher arousal, and aspires to a more dominant position in the pack strata, most of the intra-pack conflicts are instigated by Mingo- with the exception of the conflicts arising from proximity to unfamiliar dogs. Due to the intra-pack tension, when designing the family’s behavior modification program, we elected to split the dogs temporarily. Time apart may aid in desensitizing the dogs to one another. Moreover, Mingo was exhibiting severe impulse control, high arousal, and dominance issues, whereby he was often intractable in response to Kathy and Greg’s handling efforts. Therefore, Kathy, Greg and CPT agreed that the best route was to board train Mingo while training Murphy privately. Mingo’s program would focus on general impulse control, household manners, basic obedience, and socialization on and off-leash with other dogs. 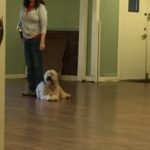 Murphy’s program would focus on leash walking and on-leash socialization with other dogs. Murphy performing the Dual Approach-Dogs Adjacent Dog Reactivity Drill. Direct staring from a dual approach can be highly provocative, especially in the absence of a human buffer. However, the CPT Dog Reactivity Drills have taught Murphy to ignore Halo and instead pay attention to Kathy. Lunging and snarling have been replaced by loose leash walking and focused attention. Murphy started with an in-home private lesson on leash walking. The first goal was to teach Murphy to walk on a loose leash without pulling. We changed his equipment to a Gentle Leader head halter collar and a high-quality leather leash. We also integrated clicker training, where we clicked, verbally marked, and rewarded with food whenever Murphy both positioned himself properly and provided upward focused attention. CPT Head Trainer Mark Spivak prepped Murphy. Once Murphy reliably remained in heel position and provided a fair degree of attention Mark coached Kathy and Greg on leash walking mechanics. Mark then gave the Kathy and Greg homework to walk Murphy distal to neighborhood dogs while consistently applying the new leash walking protocols. After about a week of practice Kathy, Greg, and Mark next met at CPT, along with CPT Trainer Patricia King and a volunteer dog, Halo. 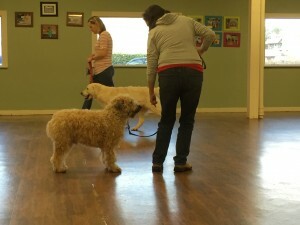 The private session began with an evaluation of Murphy’s leash walking skills. Kathy and Greg did a great job of implementing the protocols. Murphy consistently walked on a loose leash without a dog in the room and frequently provided upward focused attention. Therefore, we proceeded by exposing Murphy to Halo within the context of the seven CPT Dog Reactivity Leash Walking Drills. The Drills encompass any spatial perspective in which one may meet a dog while on a walk- behind, alongside, in front, dual approach w/ handlers adjacent, dual approach w/ dogs adjacent, single approach w/ volunteer stationary, and single approach w/ subject stationary. 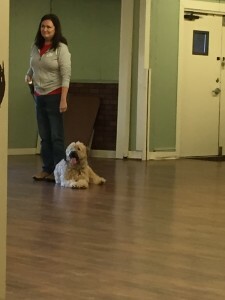 The Drills take advantage of previously learned skills and then apply them in a counterconditioning and desensitization construct that educates dogs (and handlers) to remain relaxed while walking near unfamiliar dogs. Instead of pulling, growling, barking, snarling, or lunging, the subject dog learns to maintain a calm loose leash position and to cope with the stress by looking upward toward the handler, whereby the dog receives a click, verbal reinforcement, and a food reward. In each spatial context, as Murphy became comfortable with Halo at a distance we gradually moved Halo closer, until Murphy could calmly cope with Halo when only 18-inches apart. Murphy relaxes while preparing to commence the CPT Single Approach-Subject Stationary Dog Reactivity Drill. When starting Murphy’s training, we assessed him as frustrated and wanting to greet when at a distance, but insecure and defensive as the unfamiliar dog approached. However, the sequential behavior modification program taught Murphy to become more confident and relaxed around other dogs and that the alternative coping behavior of remaining calm and attentive was more beneficial in acquiring desired overall outcomes. If you have a dog that is reactive to people or dogs when on-leash, we encourage you to contact CPT. A properly designed and implemented behavior modification program can quickly work wonders in creating a dog that is a much more pleasant walking companion. As a result, you will become happier with your dog and your dog will have a happier quality of life, since you will likely walk him/her more frequently- without sneers, grimaces, and snide remarks from the neighbors, who will appreciate and admire the progress achieved by you and your dog.